(Nanowerk News) Their work comes with a Nietzsche-esque warning: Use enough. If you don’t kill them, you make them stronger. 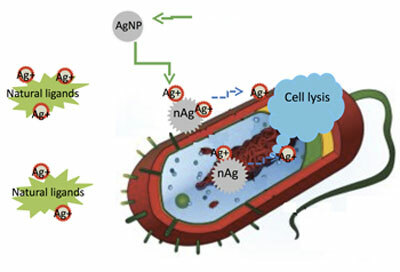 Silver ions delivered by nanoparticles to bacteria promote lysis, the process by which cells break down and ultimately die, which makes silver nanoparticles a superior and widely used antibacterial agent. New research by Rice University found that silver ions, not the particles themselves, are toxic to bacteria. They also found that ligands in the vicinity of a bacteria can bind silver ions and prevent them from reaching their target. Graphic by Zongming Xiu Scientists have long known that silver ions, which flow from nanoparticles when oxidized, are deadly to bacteria. Silver nanoparticles are used just about everywhere, including in cosmetics, socks, food containers, detergents, sprays and a wide range of other products to stop the spread of germs. But scientists have also suspected silver nanoparticles themselves may be toxic to bacteria, particularly the smallest of them at about 3 nanometers. Not so, according to the Rice team that reported its results this month in the American Chemical Society journal Nano Letters ("Negligible Particle-Specific Antibacterial Activity of Silver Nanoparticles").